GOYANG, South Korea, Sept. 7 (Yonhap) — Nam Tae-hee may have been a forgotten name for South Korean football fans, but on Friday, the attacking midfielder showed he could emerge as a core member on new coach Paulo Bento’s squad going forward. Nam, who plays with Qatari side Al-Duhail, scored the second goal in South Korea’s 2-0 win over Costa Rica in a friendly match at Goyang Stadium in Goyang, north of Seoul. It was his first international goal since November 2016 against Uzbekistan in the final Asian qualifying round for the 2018 FIFA World Cup. It was a meaningful goal for Nam, who made his national team return for the first time since October 2017 after earning selection from new head coach Bento. Nam was a key part of former coach Uli Stielike’s offensive schemes. 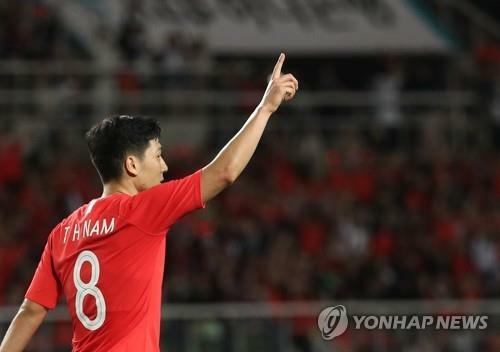 But after the German was sacked for poor performance and was replaced by Shin Tae-yong in July 2017, Nam fell out of favor. The 27-year-old was eventually left off South Korea’s roster for the 2018 FIFA World Cup. Against Costa Rica, Nam was one of two starters who didn’t compete at the World Cup. Bento had previously announced that he would mostly use World Cup members in his debut, and Nam getting a starter’s nod was somewhat surprising. As a central attacking midfielder, Nam was a consistent threat to Costa Rican defenders. In the 34th minute, he earned a penalty kick while trying to receive a long ball from Ki Sung-yueng from the midfield. Son Heung-min hit the right post with his attempt, but Lee Jae-sung was there to put in the rebound to make it 1-0. Nam then put his name on the scoring sheet in the 78th. After receiving a pass from Son, Nam showed a dazzling dribble in the box and fired a right-footed strike to double the lead.